In 1798, Napoleon Bonaparte left his fleet of seventeen French ships at the mouth of the Nile while he went on his campaign through Egypt. Close behind, Rear Admiral Horatio Nelson was preparing for an attack with five British men-o'-war. On August 1st, a few hours before sunset, Nelson order his ships to attack by going in between French ships and firing on both sides. 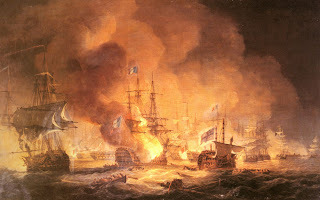 The French would fire back, but they were in danger of hitting their own ships as well due to overshooting their target. When the Orient, the 120-gun French flagship, exploded, the battle was close to its end. In the end, the British captured or sank all but two of the French ships. About 10,000 French lives and 1,000 British lives were lost in the attack. This battle was the turning point of the British naval campaign against the French, and when Nelson, realizing the importance of the battle, famously said, "Before this time tomorrow I shall have gained a peerage, or Westminster Abbey." Luckily for Nelson, he recieved the former and went down in history as the famous Lord Nelson.